The BP oil spill crisis was one that dominated the headlines of 2010, with endless coverage of how the Deepwater Horizon oil rig exploded in the Gulf of Mexico, leading to gallons upon gallons of oil being leaked into the ocean and causing God knows how much damage to the environment. Of course, it only being six years ago, it’s an event that’s still pretty fresh in the memory, one that has affected the lives of so many people that to this day it’s still a huge blackspot on BP’s legacy. The decision to make an action/disaster film surrounding these events, specifically the oil rig explosion itself, may come across to some as being rather insensitive, since 11 people actually died in the real-life disaster, and the oceans are still feeling the effects of the spillage. The hiring of director Peter Berg, known specifically for action films (including, of all things, Battleship), to replace original director J.C. Chandor might have also been some cause for concern, with some wondering how or even if such a delicate and fresh-in-the-memory environmental disaster could work as a straightforward action-drama with a hint of disaster. What’s surprising about Deepwater Horizon, or at least the final product, is not just how seriously the film treats the real-life event – as it should – but how thoughtful it can actually be when approaching the subject. In fact, I wouldn’t even call this a disaster film, at least not in the same realm as The Towering Inferno or at least 50% of Roland Emmerich’s filmography; it’s far more of a straight-laced docu-drama, one that doesn’t dumb down its political and economic discussions for the sake of a larger audience, and lets you really feel the atmosphere and desperation of these ordinary people who want nothing more than to just escape a fiery death. In the film, our surrogate is Mike Williams (Mark Wahlberg), an oil rig worker who is contracted to work for 21 days on the Deepwater Horizon rig, alongside his boss “Mr. Jimmy” (Kurt Russell) and fellow workers like Gina Rodriguez’s Andrea, and Dylan O’Brien’s Caleb. Upon arrival to the rig, they find that not everything is running smoothly: the operation is running over-budget and under schedule, workers are being sent back to shore, electricals such as the phone and smoke alarms are malfunctioning, and there is intense egging on from BP officials like John Malkovich’s Donald Vidrine to speed up the process to get back on track. Needless to say, the pressure – both from BP and the oil drill – leads to explosive consequences that we’re all too familiar with. For the first half of this movie, right up until the initial explosion that led to one of the worst oil crises in US history, it is directed almost like a Paul Greengrass or Kathryn Bigelow movie (with slightly less nauseating camera-work). It has a documentary feel to it, from the natural dialogue delivery to the heavy focus on industrial jargon and procedurals, which would otherwise be pretty boring but there’s something oddly fascinating about it all, even if you – like I admittedly did – can’t for the life of you understand everything that is being talked about. In a strange way, I can see this film as being a spiritual sequel to Captain Phillips, because not only does it have that same feel to it – albeit with less Somali pirates – but it also treats the real-life events that inspired the dramatic retelling with the utmost respect and seriousness, as it does with the audience who, once again, isn’t talked down to in the slightest. Luckily, the characters are decent enough to want to keep watching, from Wahlberg’s family man – as well as his wife (Kate Hudson) and daughter (Stella Allen) – to Kurt Russell being as slyly charming as ever as the gruff but good-hearted boss. When the explosion finally does happen, it’s non-stop fire and explosions, but even then it still manages to be incredibly thoughtful about the situation. Again, I really don’t think this is meant to be a disaster movie in the traditional sense, despite the marketing making it look that way, because the characters aren’t clichés or old stereotypes (nobody is one shift away from retirement), and the disaster is legitimately threatening and, thanks to some strong sound design and intense cinematography and editing, absolutely terrifying. Pretty quickly, you realise that this film isn’t really about the disastrous impact the explosion had on the environment, but rather just about this group of people just trying to survive and get out of a bad situation with their lives intact. Nowhere is this more prominent than in the film’s final few scenes, which feature Wahlberg at some of his best, and bring about the emotion and heartbreak without once feeling manipulative. In those closing moments, it’s clear that the point of this film is to try and get across the impact that the event had on a group of ordinary people, with the rest of the story about the oil spillage reduced to closing text. In that regard, it does the job effectively, intelligently, and all without coming across as cheap exploitation of a real-life event that killed several people and destroyed an entire eco-system. It’s an enthralling cinematic experience, one that gives you the explosions and survival tactics most audiences might expect from a film like this, but also – unlike many other action/disaster movies out there – has what I like to call the Wizard of Oz trio: a brain, a heart, and courage. 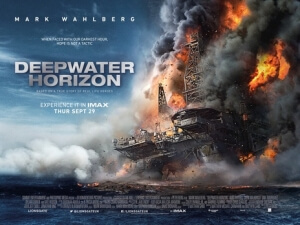 Deepwater Horizon handles the delicate subject matter of the 2010 BP oil spill with surprisingly intellectual respect, refusing to dumb things down for audiences even when things turn more action-orientated, and presenting a solid story of survivors in a truly harrowing situation that doesn’t once feel exploitative or cheap.